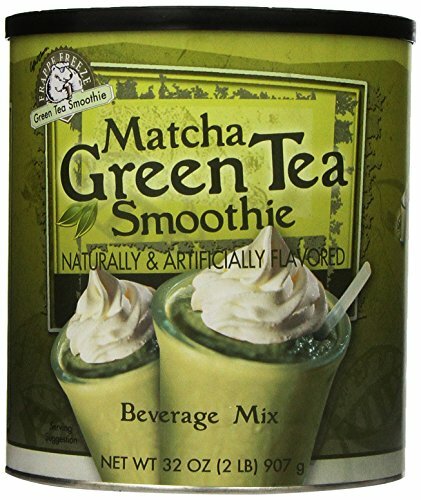 32oz Caffe D’Amore Matcha Green Tea Smoothie Mix Beverage. New & sealed in factory packaging. One tub per order. Net weight 32oz (2 Pounds) per tub. Easy to prepare and delicious! The possibilities are endless! Excellent for Matcha Green Tea Smoothie, Pomegranate Blueberry Green Tea Smoothie, Raspberry Green Tea Smoothie (see recipes on label packaging). Zero grams Trans Fat. About 21 servings per tub. Serving size 3 tablespoon. One tub per order. Net weight 32oz (2 Pounds) per tub. Excellent for Matcha Green Tea Smoothie, Pomegranate Blueberry Green Tea Smoothie, Raspberry Green Tea Smoothie. About 21 servings per tub. Serving size 3 tablespoon.